Want More Visibility and Credibility? Speak Out! An important part of personal branding and leadership branding is gaining the visibility and credibility with your target audience. One way to do that is to speak up and speak out – either as a speaker in front of an audience or as a member or leader of a team where speaking up at meetings and conferences help promote your brand. If you want those that matter to know how much value you can contribute, public speaking is a great way to get that point across – by showing rather than telling. Yet public speaking is one area where both seasoned and aspiring leaders have the most difficulty. Many people say they have a fear of public speaking. When they get up in front of an audience, they become anx ious and sweaty and forget their speeches. While this all makes sense, you could also say it’s not only the fear of public speaking that is the problem, it’s the fear of what uncomfortable things may come up when speaking in front of people. People create associations all of their lives. They associate their physiology with good or bad things. A person who gets sweaty palms or butterflies in the stomach in front of an audience just knows that’s a bad sign. However, it doesn’t have to be that way. A 2013 study in Clinical Psychological Science shows our reaction to our physiology can be altered. By understanding that physiological responses when in front of a group of people are just the body’s way of handling stress, you can create new associations. When I was in high school I auditioned for and was selected to portray Portia in the Merchant of Venice. I was terrific in rehearsals, knew my lines and was thrilled to be a part of the production. The evening of the performance, I froze and had to be walked off the stage with my understudy completing the show. In the years that followed my fear of public speaking loomed large and I avoided the prospect each and every time an offer to speak was presented to me. The memory of freezing on stage haunted me for many years. After years of forcing myself to take on public speaking engagements in spite of my fear of freezing up and of hearing the wild beating of my racing heart, I can honestly say that I now enjoy doing it. So much that I actually seek out opportunities to get up on the podium. I recognize that I will be nervous each and every time but I now accept it as fact, take a deep breath and start giving my talk. It works every time. By reminding yourself those physical sensations are just the body doing its thing, and that it’s not bad or good, you can be back in control of your body and your presence on stage. Stop worrying about how you look or how uncomfortable you feel and move your attention from you to the audience. After all, that’s the reason you’re there in the first place. So be curious about your audience, who they are, why they are there, and what demographic they represent. Focus on the topic and that should keep your mind occupied. Once you shift your focus on the value you can provide to this specific audience, you won’t have time to worry about yourself and the end result will be far better. Famed American billionaire Warren Buffet had a huge fear of public speaking. He even dropped out of a public speaking course before it started because of his anxiety. His ultimate cure was to begin teaching topics he enjoyed to force himself to be in front of a roomful of people. Eventually, the joy of teaching overshadowed his fear of being in front of the class, but he had to do this over and over again in order to overcome his distress. Pick one of your anxieties, and find a way to be right in it. Notice: you didn’t perish, you weren’t mortally wounded and you even survived in one piece. Slap yourself on the back for succeeding, and go do it again. Eventually, you’ll wonder what the big deal was. If you need a little motivation, organizations such as Toastmasters are good at helping you find your anxieties, and begin working on them. 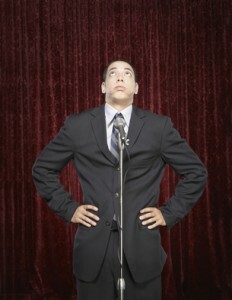 What advice do you have for overcoming public speaking uneasiness? Share them in the comments. Need help building credibility and visibility? Contact me. Hillary Stroup, an MBA student and public relations consultant, co-wrote this post. She has over ten years of experience helping small businesses succeed through rough patches. She started out as a wedding planner and her business has grown from there.